PS2 Patch Engine is a tool designed to embed both static (ELF) and run-time (memory) patches directly into PS2 disc images. Images may be in .iso, .img or .bin format, .bin images can also be converted to .iso. Not all games will work but, based on analysis, compatibility should be better than 95%. Patched images are compatible with both PS2 emulators and real PS2 hardware and have been tested with PCSX2, OPL, ESR discs and the PS3's PS2 Classics emulator. Not all cheat code types are supported! One or more of the Mastercodes provided is either incorrect or the address referenced by the hook cannot be found in any executable (ELF) on disc. Some Mastercodes which will work on CodeBreaker or ps2rd may still report this error. This was a ton of work (10,000+ lines of C) so I'm hopeful that it finds some use. "It's asked me a question...what do I do?" "I got an error...what does it mean?" "Too many patches to embed"
PS2 Patch Engine can embed more than 100 patches per-executable into most games (the actual limit varies from game to game but the absolute maximum is 160), this error indicates that the number of memory patches exceeds the game's patch limit. Note: While there is no explicit limit on the number of ELF patches that can be applied the total number of applied patches is limited to 1024; patches after 1024 will be ignored. "Patch list contains unsupported cheat types"
"Patch list contains misaligned writes"
"This patch works perfectly in PCSX2 and/or ps2rd but it doesn't work with this!" Some patches are meant to be applied at run-time (rewritten constantly) while others can be written once directly into the game's executable. If the address specified by a patch falls into the memory range that an executable occupies then the patch will, by default, be applied there instead of at run-time. "Why can't I use other cheat types?" "Why can't it apply more memory patches?" "The program doesn't work for hack XXXXX on game XXXXX!!!" First try marking patches as "memory" (as described above), next try disabling 'Autohook' and entering a Mastercode. "How can you embed code into an executable without breaking it?" - By knowing that PS2 games are written in C - in this case by exploiting string.h. - string.h functions compiled into PS2 games are stand-alone and vector optimized to take advantage of the PS2's 128-bit registers and vector instruction set, this can make them very fast for very large data sets but it also makes the implementations very long. - It is possible to write much shorter but identically functional versions of these routines - this is how PS2 Patch Engine creates usable space in the executable where the code for the patch engine and the patch tables reside. - The following functions can be replaced by PS2 Patch Engine: memcpy, strncpy, strlen, strcpy, memchr, memset (replaced in that order as patch table size requires), in the case of memcpy, memmove must also be located in the executable so that the memcpy function can be replaced by a single jump instruction. - In order to verify the shorter implementations of these functions I used Red Hat's string.h test for embedded systems, compiled with PS2SDK and tested in PCSX2. - Interesting side note - the implementation of strcat produced by PS2SDK actually fails this test (I used a reference implementation in C when testing to avoid false errors). "What is the performance impact of running an embedded patch engine?" That's a tricky question - on the one hand the replaced string.h functions should be much slower for large data sets, but for very small (possibly more commmon) data sets they may actually be the same or even faster. One thing is for sure - the performance will not be identical but given the speed of the Emotion Engine (290+ Mhz) the differences *should* be effectively unnoticable. "Do modified .bin files have correct error coding?" Yes! EDC (Error Detection Code) and ECC (Error Correcting Code) are recalculated for each modified sector in .bin files, I have verified correct calculation for Mode 1 and Mode 2 Form 1 sectors. Yes! 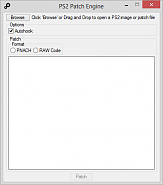 PS2 Patch Engine does not modify any part of an image that would break a multi-track image, it will also automatically create a matching .cue file when patching a .bin image if one already exists in the same directory as the .bin.